Remember, I’m still learning how to cook.. and un-cook for that matter! Even now, as I want to make vegan meals that I have already blogged, I must go back and check.. read through and practice. Practice and repetition are important so as one day I can just cook off the fly. For example, I’m craving an eggless omelette that I made early on with my blog– but I haven’t had enough practice yet to recall it from memory. However… TOFU is a different story! I feel I am becoming one with tofu.. lol. It’s one of my main protein sources, not that I need too much protein since I am an advid juicer and fairly well-balanced with nuts and beans. REMEMBER ALWAYS ORGANIC when it comes to TOFU. I can’t wait for a class I am taking next week: The Art of Making Tofu.. I think from scratch- how exciting! I followed directions for a sesame tofu perfectly. Tonight I wanted that same tofu but I didn’t feel like researching anything. Impressively, I remembered! 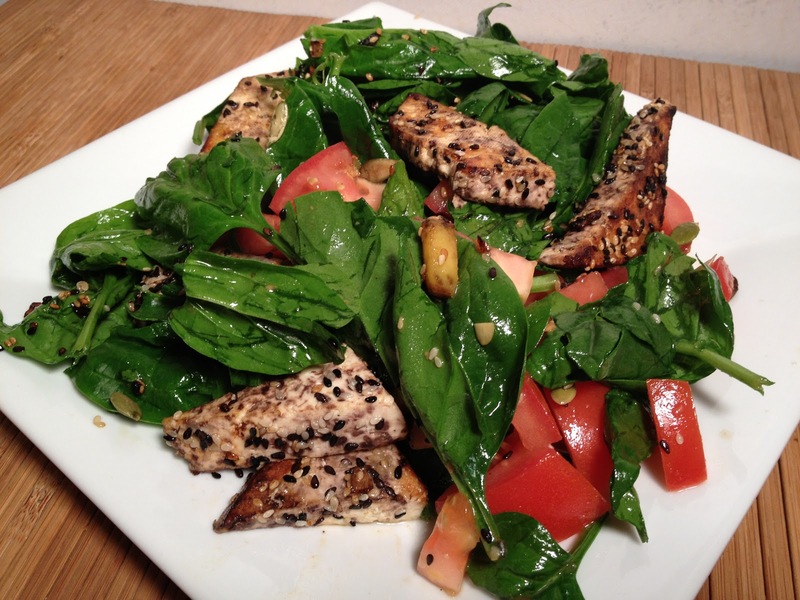 I was simply in the mood for a healthy spinach salad with some lightly sautéed tofu with a sesame crust. I followed a recipe that I used months ago- it’s worth mentioning again! I cut the tofu depth wise and blotted it dry. Then I cut them into triangles and continued to dry them a bit with a paper towel. Next I put some white and black sesame seeds in a bowl. I dipped the tofu into the seeds on both sides. In a frying pan, I added a little coconut oil and lightly sautéed the tofu. The spinach salad dressing I used today was part extra-virgin olive oil (1 tablespoon), shoyu (few drops), sesame oil (few drops) and brown rice vinegar (1 tablespoon).